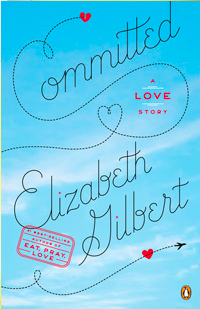 I’ve been reading Elizabeth Gilbert’s new book, Committed (her follow-up to Eat, Pray, Love). It’s both a love story and a history of marriage, a rare departure for me into nonfiction. It’s blowing my mind in all the very best ways but a short section on the idea of trading our stories has haunted me since I read it over tea and toast this morning. About three quarters of the way into the book she talks about how we share our memories, our stories, with other people. Sometimes it’s a stranger on the bus, sometimes it’s the person in our bed. In the act of telling the story we really do share it. The story still belongs to us, but now it also belongs, in part at least, to the person we told it too. Now they carry the story as well. When the story we tell is a personal one, our memory goes with it. I could tell you a story about running on the beach when I was a little girl, the sound of the quiet ripples I used to think were waves, the heat of the sun on my shoulders. If I describe it well enough you might remember the story the next day and share it with a friend. In so doing you will have remembered MY memory. Isn’t that the strangest thing? Gilbert illustrates this with a favorite story from Italo Calvino's Invisible Cities. In the story there are these tradesmen who spend most of year crossing the desert arriving only on the equinoxes to buy and sell their wares. At night, after trading, they sit around a fire and the trading of stories begins. “Tell me a story about your sister,” says one. “Tell me a story about a wolf,” says another. In the days that follow as they make their way back out across the desert they find each one now has two sisters travelling with him – the one he remembers and the one in the story from the fire. The story has done the impossible, sharing itself out without diminishing the original. A very fancy party trick. When people are in love we speak of giving a piece of ourselves away. I think that happens any time two human beings make enough of a connection to bump up against each other. Not a piece though, just a tiny thread, a blink, a moment of who we are. Sometimes those moments get brushed off our sleeves, other times, for better or worse they get woven inextricably into our own story. Sometimes a single thread can worm its way into your heart like a thorn, but it’s rare to catch one of those in a chance meeting. Thorns usually take time to cultivate. There is incredible power in the telling of our stories. If someone is suffering in a way that I have suffered, I can share my story and in doing so, walk with them. I can say, “See? Me too,” and she will walk through the next day knowing she is not alone. There’s a line in the movie Shall We Dance that has always stuck with me. In the scene two characters are trying to decide if their marriage of 25 years is still worth the effort. They are trying to describe the role they play for each other and Susan Sarandon turns to Richard Gere and says, “I will witness your life. You life will not go unnoticed because I will notice it.” I always thought that was incredibly beautiful. It’s easy to notice the hero, the grand gesture, a marriage proposal, the day you bring a child home. It’s harder to notice a thousand tiny moments, and I think that is part of the work of marriage. It’s promising to pay attention. This is intimacy: telling our stories in the dark. One of the most profound moments of my life happened late at night over the telling of stories. I was in my apartment, my last year at Trinity, my roommate asleep in the other room. I was sitting on a ratty and beloved couch with a decidedly not ratty but also beloved old friend and somehow he got me to tell him the story that I never tell anyone. I remember feeling so exposed I hid my face behind a pillow and all we were doing was talking. He was sitting at the other end of the couch, not touching at all. It was, I can see now, an incredibly intimate moment. No wonder I was so shaken afterward. No wonder the letter he slipped under my door 20 minutes later is still tucked into my journal. Plato said that “He who tells the stories shapes society” and I’ve always thought of that on a grand, national scale. But I see now that she who tells the stories shapes herself. It is in changing ourselves first that we have any hope of changing society. It is in the telling our of stories that our souls come home.